Deposit No. 1188, or the Khneifiss mines, opened in 1971 with an initial output of 300,000 tons per year. 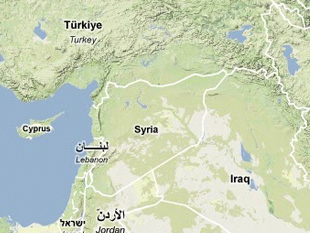 It is now Syria's largest phosphate mine, producing approximately 1.1 million tons of phosphate ore per year. Phosphate rock from the Khneifiss mines is used to produce phosphoric acid at the Homs fertilizer plant. S. Atfeh, "The phosphoric resources of Syria," Phosphate Deposits of the World 2, eds. A.J.G. Nothold, R.P. Sheldon, and D.F. Davidson (Cambridge, UK: Cambridge University Press, 1989); "Syria - The Fertilizer Sector," APS Review Downstream Trends, 13 March 2000, www.allbuziness.com. Jamal Asfahani, "Phosphate Prospecting Using Natural Gamma Ray Well Logging in the Khneifiss Mine, Syria," Exploration and Mining Geology 11, Nos. 1-4, 2002, p. 61; "Arab Republic of Syria," The Middle East Annual Review 1975-6 (Saffron Walden, Essex, England: The Middle East Review Company Limited, 1975-1976), p. 259. "The Syrian Refining Sector," The Free Library, 1998, www.thefreelibrary.com. "Syria: Economic Survey," The Middle East: A Political and Economic Survey, ed. Peter Mansfield (London: Oxford University Press, 1973), p. 486. "The Syrian Refining Sector," The Free Library, 1998, www.thefreelibrary.com; S. Atfeh, "The phosphoric resources of Syria," Phosphate Deposits of the World 2, eds. A.J.G. Notholt, R.P. Sheldon, and D.F. Davidson, (Cambridge, UK: Cambridge University Press, 1989), p. 361. Carlotta B. Chernoff and G.J. Orris, "Data Set of World Phosphate Mines, Deposits, and Occurrences - Part A.: Geological Data," U.S. Geological Survey, 2002. Y. Koudsi, S. Khorfan, H. Shleweit, A. Dahdouh, and M. Sweid, "Effect of Oxidation-Reduction on the Extraction of Uranium from Wet Phosphoric Acid by DEHPA/TOPO," Aalam Al-Zarra, Mar-Apr 1998, 54, pp. 59-62; S. Khorfan, Y. Koudsi, A. Dahdouh, and H. Shleweit, "Preliminary investigation on the extraction of uranium from Syrian phosphoric acid," International Conference on Uranium Extraction, Chinese Nuclear Society, 1996.